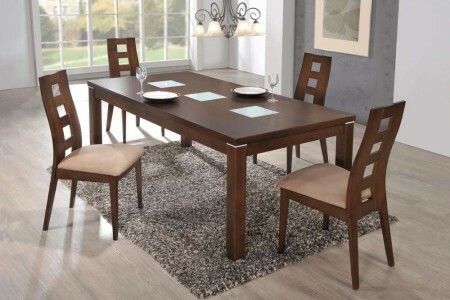 Table: 79" x 40" x 31"
Chair: 23" x 20" x 40"
Modern styled D4930DT large dining room set offers burnt wood finish which is unique and beautiful. Table top features metallic pieces on the sides and a three glass inserts. Rich burnt wood finish over solid wood construction along with clean sleek lines makes this a one of the kind product. High cut out back dining chairs offer comfort and durability along with beige microfiber cushioned seats.